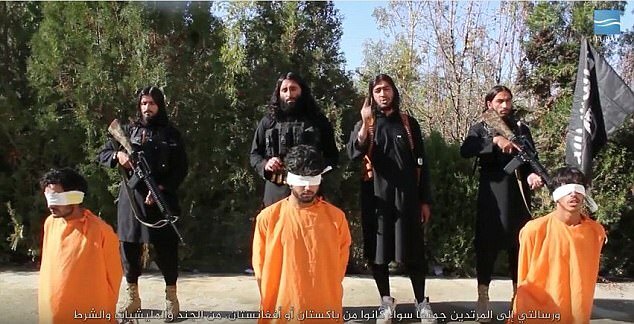 Brainwashed children brandishing handguns shoot prisoners in the back of the head in a brutal new ISIS execution video. The two boys, both dressed in black, force their captives to kneel in front of them in front of the doorway of a building in Afghanistan. Footage shows them aggressively pulling back the heads of the two terrified ‘spies’ before the younger of the two jihadists starts ranting at the camera. They then point their handguns at their prisoners and carry out the killings. 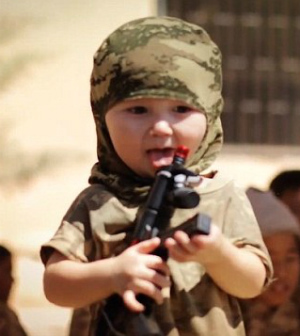 The children are so-called ‘cubs of the caliphate’ – the name given to youngsters who have been brainwashed with ISIS ideologies and trained to fight and kill for the terror group. ISIS has released several videos, including one earlier this year, showing young children carrying out brutal executions of adults, training with weapons, and pledging allegiance to ISIS. Last month it emerged that the head of ISIS in Afghanistan was killed in a raid carried out by Afghan and US special forces, the country’s president said. Abdul Hasib died during an attack by 50 US special forces and 40 Afghan commandos overnight on April 27, President Ashraf Ghani said. Since its declaration of a Caliphate in 2014, the Islamic State (IS) has released a number of publications depicting children participating in rallies, undergoing training, undertaking combat operations and even executing prisoners. Armed groups exploiting children in war zones is nothing new and across Iraq and Syria, many factions have been accused of employing children as spies and messengers to actual soldiers. However, the scale and sophistication employed by the IS in attracting, coercing, training and indoctrinating children into its cause is particularly noteworthy. 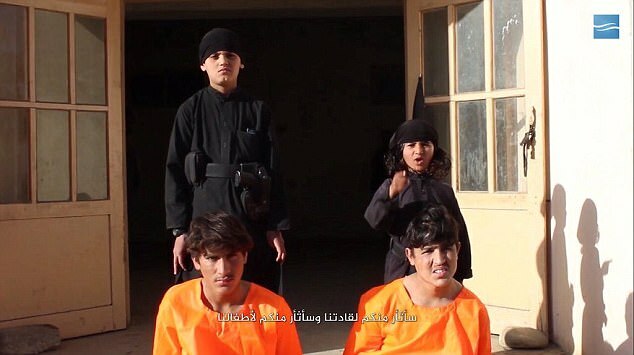 Referred to as the “Cubs of the Caliphate” (ashbal alkhalifa), these children are not just a present-day threat on the battlefield, but a potential threat for the future, as the question of what happens to them once the Islamic State is defeated remains. of practical and political reasons. The IS is certainly aware of these benefits when it includes children in its operations. However, the IS’ motivations for recruiting children extend beyond simple pragmatism. 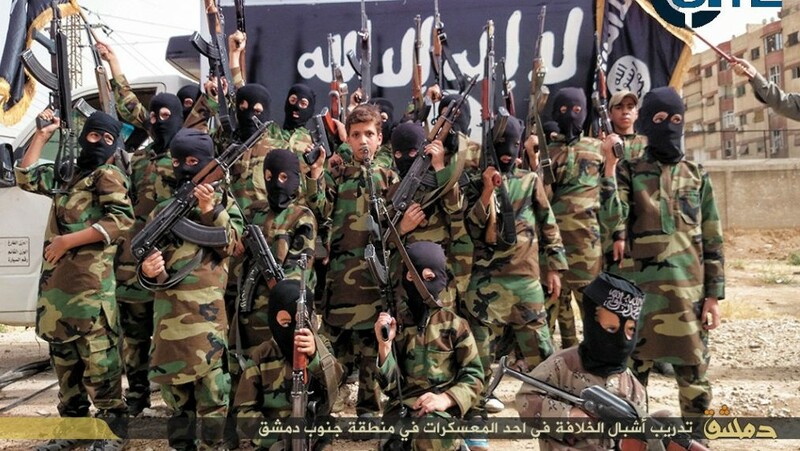 By training children in not only warfare but also ideology, the IS seems to be working towards consolidating its state-building project and making sure that even if its organisation comes to an end, its ideology will persist. Moreover, although the IS has attracted a number of foreign fighters into its fold, it has consistently failed to attract the loyalty of major jihadist organisations or worldwide grassroots support. The fact that the IS seems to not just train children as soldiers but raise them as a new generation of citizens loyal to its cause supports the notion that it has “given up” on gaining the support of the adult population in the areas it inhabits. The purpose of this report is therefore to analyse how the IS recruits children into its cause, whether through forceful means like kidnap and coercion or through means based on enticement to encourage children to join voluntarily. It then looks into the training camps and schools operated by the IS to see how the children are gradually de-sensitised to violence trained in combat and ideology. As a result of the Syrian Civil War and the US occupation of Iraq and the subsequent insurgency, many areas across Syria and Iraq have suffered from endemic insecurity, scarcity and unavailability of public services. Under these circumstances, one of the Islamic State’s greatest sources of legitimacy in the areas it controls has been the restoration of security and services in the areas it controls. The IS is well aware of the propaganda value of such efforts and in the areas it has limited control over or has not consolidated yet, it tends to engage in a “charm offensive” designed towards familiarising the locals with the positive side of the IS. Referred to as Da’wa (“the call”), these events cost the IS little but can build up tremendous grassroots support. Da’wa sessions involve distribution of food and drink, informing the locals about “matters of their religion”, and informing the locals of its policies in a manner that will avoid backlash. adults. Observers report that in Aleppo, the Da’wa sessions aimed at youth involved competitions and contests with prizes for winners, Qur’an reading sessions, video viewing parties to regale them with “epic battles” and members of the organisation handing pamphlets to children. The education sector has been one of the hardest-hit sectors in Syria since the beginning of the civil war, with many schools either damaged by fighting or being used to house refugees. Syria’s pre-war literacy rate of %90 has plummeted and it is estimated that 2.8 million Syrian children are out of school10. The education vacuum has proven ideal recruitment tool for many of the armed groups in Syria, including the IS. The IS has provided shelter and education for many out-ofschool children in the region, grooming them for recruitment in the process. exposure and recruitment for the organisation. The on-going conflicts across Syria and Iraq have not only led to a collapse of security and public services, but also a drastic reduction of incomes and opportunities, forcing many Iraqis and Syrians below poverty line. Just as the case in social services and security, the IS has used its ability to provide jobs and income to bolster its legitimacy, offering incomes, bribes and gifts to those it wants to recruit. Children and youth are no exception. As mentioned above, Da’wa sessions often feature gifts and competitions with rewards for winners attached to them. However, beyond rewards for winners, members of the IS have been known to offer small gifts (such as toys and sweets) to all children who participate in meet-and-greet events. Children have also been given simple but inclusive tasks (such as waving a flag for a photo) that bolster the sense of belonging among potential recruits. The IS has employed similar tactics towards older children and teenagers, although appealing to other forms of enticement. Observers in Iraq have noted that especially across Anbar, the organisation have regaled potential recruits with promises of power, status, prestige and revenge against the Shia. Recruiters of the Islamic State had access to luxury goods (such as high-end cars) that would be beyond the reach of an ordinary citizen, tying together notions of prosperity and the Islamic State. Beyond gifts and token rewards, the Islamic State has found cash to be just as viable a recruiting tool. At the height of its power, the organisation was earning significant funds through the oil trade, taxation, smuggling and looting. This has allowed it to offer its fighters much higher salaries than those of other armed groups or even members of the Syrian or Iraqi militaries. In a region wracked with poverty and lack of prospects, the notion of a steady income alone has driven potential recruits, young and old, to sign up with the organisation. Islamic State are given a Kalashnikov, ammunition, uniform and tied to $100.